A few weeks ago the pair (or perhaps another) were at it again, methodically constructing one atop the highest eave support on the north side of the house — the one at the top of “V” of the roof. Again it seemed like a great location: accessible to them but not unwanted critters, shielded and certainly more stable. Then came the pair of mourning doves. Who knew they could be such heartless bastards!? I remember seeing them up on the crossbeam where the nest was and thinking nothing of it. After all, they’re doves… symbols of freakin’ peace and harmony. Oh hell no. Nature is so not about peace and harmony. It’s about ruthless competition, and the doves didn’t just drive the sparrows out and take over the nest. They evicted the couple and demolished the thing. 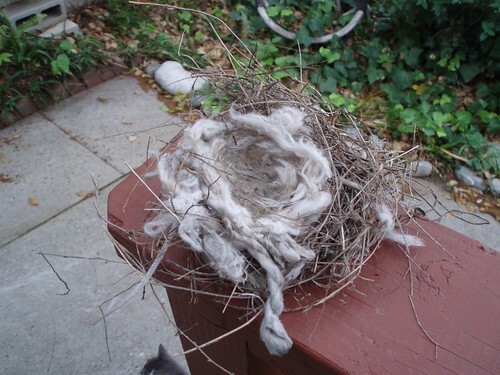 Instead of being proper birds and finding their own raw materials to build a nest, they went the easy route and took whatever they needed away from the sparrows’ home to build one wherever they’re nesting, probably nearby. I’d been false-hoping the raid was committed before the momma sparrow had laid eggs, but that was clearly not the case when I looked out what will be our new bedroom window this morning and found nothing of the nest left above and down below on the dining room’s bay window roof the shattered sticky remains of a couple tiny eggs splatted among some twigs and such. This entry was posted on Wednesday, May 6th, 2009 at 6:33 am and is filed under animals, nature. You can follow any responses to this entry through the RSS 2.0 feed. Both comments and pings are currently closed.